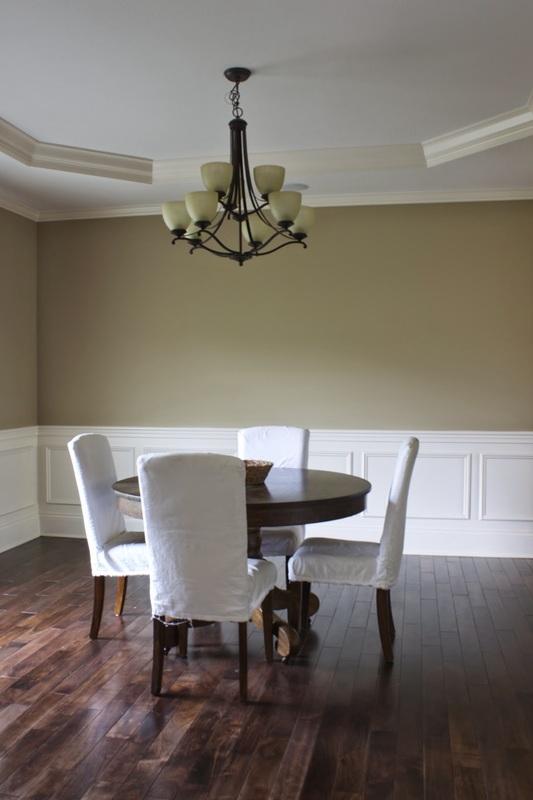 I've been tossing around the idea of using a dark, dramatic color on the walls in the dining room. 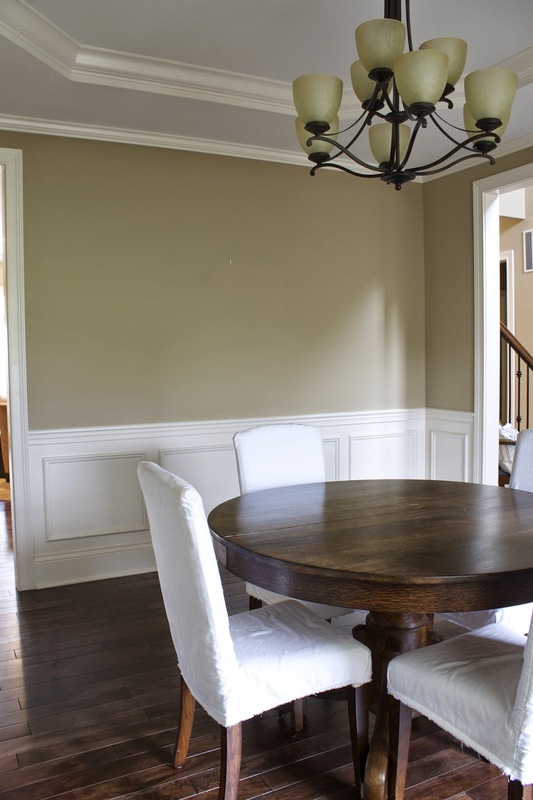 This room at the front of the house gets plenty of natural light, and the bottom third of the wall has picture frame molding, so there is no danger of the room feeling too dark or enclosed. I'm in the process of deciding whether to go with a dark navy blue or a charcoal-meets-navy. This color will be used in certain other rooms throughout the house, maybe the powder room, maybe even our master bedroom. I want a color that works throughout the house in different areas, rather than just one room, which would feel unplanned. Sadly, I know this from experience. 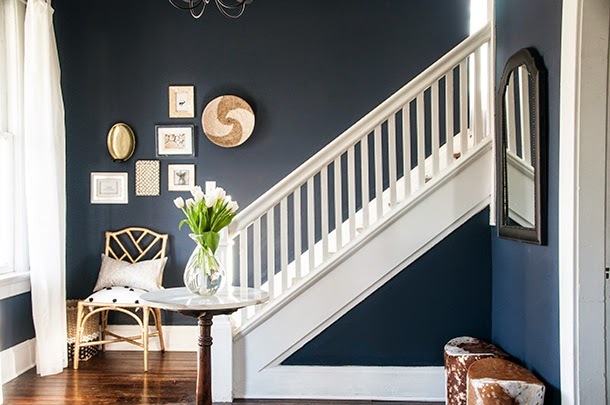 This beautiful foyer from House of Earnest is the image that cemented the idea in my mind. Even more exciting, her previous wall color was similar to my current tan. The before & after is amazing. I shared the transformation with my hubby, who whose excitement was easily contained. Football was happening at that moment, so his attention may have been divided. The backs of the bookshelves below are painted "Urbane Bronze" and I will try a sample of that color too, in case the blue feels like too much. This is a color I've had my eye on for a long time. So, assuming that I finish the other two projects hanging over my head, I'll start work on the dining room. 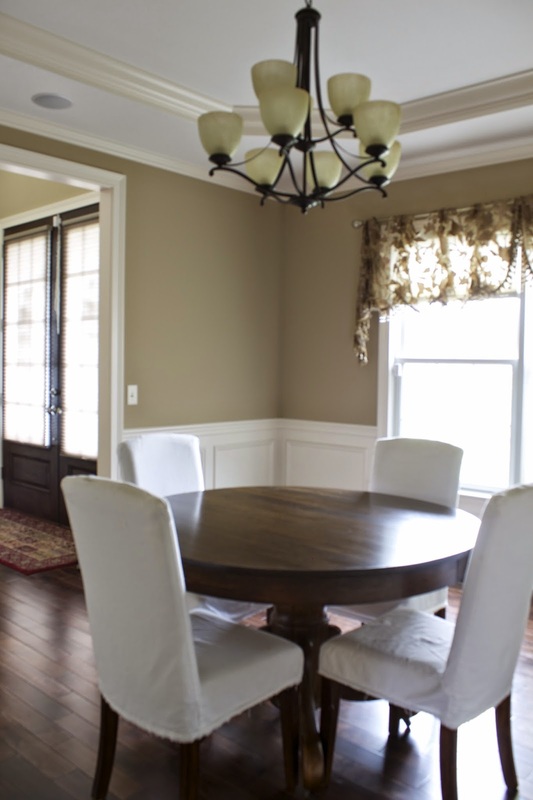 The plan is to keep it simple in there, just update the wall color, change the curtains, and add a rug under the table. I will put something on the walls eventually, and I'd love to change the light, but with as little activity as this room sees, I'd rather focus on other areas of the house instead. Natalie is growing very impatient, for example. That wall of bookshelves is amazing! I love the picture that is inspiring you...the white really pops!